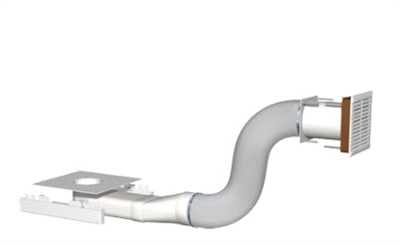 The InFlow™ W125 ducting kit enables any IQAir filtration system to draw air through a wall or window vent into an indoor environment. Use of the InFlow W125 is advisable when the main pollution source is located in adjacent indoor environments or outdoors. An IQAir filter system combined with an InFlow W125 can be installed to draw outdoor air into an indoor environment. In this setup, an IQAir serves as a ventilation system, bringing in oxygen-rich outdoor air and a filtration system, which removes undesirable outdoor pollutants such as pollen, mold spores, dust and exhaust soot. As a result, fresh and filtered outside air comes into the room. An IQAir filter system combined with an InFlow W125, which draws air into a room will in most cases allow the creation of a positive pressure. This positive pressure helps to clean the air in a room by constantly flushing out air pollutants and by preventing outside pollutants from entering the room. The InFlow W125 kit can be easily added to any IQAir filtration unit in a matter of minutes. As regards the building, the only modification required is a 5" hole in a window, wall or door which allows you to connect the InFlow W125 duct. The duct may be freely flexed to allow control over the desired vent location. It is expandable in length, from 10" in its original compressed state, to 39" when fully extended. Compatible with all IQAir filtration devices. Not compatible with the accessories PF40™, VMF, VM FlexVac™, VM InFlow and FlexVac™.